Hi, I am interested in your 1963 Chevrolet Nova (stock #5167-CHA) listed on Autotrader for $31,995. I'd like to get more information about this vehicle and confirm its availability. Do you ever just look at a car and say, Yes! 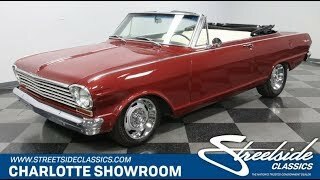 With its metallic paint, nicely finished interior, upgraded V8 power, upgraded suspension, and five-speed stick shift, this rare 1963 Chevrolet II Nova convertible fits in with the pony car crowd but also gallops in its own direction. You dont see too many of these Nova convertibles around do you? They cost about as much as some Impalas when new, and so few were willing to spend the extra cash on a droptop. It gave the convertible Nova lower production numbers where you were over 10 times more likely to see a coupe or sedan than a ragtop. Today that makes for quite a rare classic where scarcity buys true distinction. These Chevy II Novas debuted a few years before the Mustang, but this one has a lot of that same small size with big-time flare that we loved from the pony cars. You see it in the factory items that have been nicely maintained like bright grille and wide chrome bumpers. And they invested nicely in the right pieces, like the crisp black convertible top. But the real standout of this one is on the modern application of metallic maroon paint. It gives this sunshine-friendly droptop a little extra pop every time the sunlight hits the sheetmetal. The 15-inch inch Rally wheel package and aggressive stance hint that the upgrades are more than just on the surface. While you might like the look of how the lack roof complements the maroon paint, when you take the top down, you reveal a whole new dimension. The bright white on the seats and door panels contrast nicely with the paint to give you a timelessly attractive package. They did a nice job with the details everything from the radio block-off plate to the reconditioned top frame. But what youll really love is how this was made for driving. There are great classic performance elements like the bucket seats and SS steering wheel. And thats joined by upgraded like the large column-mounted tach and an extra great on the floor shifter. One look under the hood, and you can instantly see there was plenty left in the budget for upgrades here. It starts with a 350 cubic-inch crate V8. It inhales deeply with an Edelbrock aluminum intake and new Edelbrock four-barrel carburetor. So you get nice power and a sweet rumble out of the dual exhaust. Plus, you have great supporting components, like a new starter, new electronic ignition, and a new aluminum radiator. This is a great motor for the road, and so youll love the full control you get from the upgraded five-speed manual transmission. As you look at the undercarriage photos, youre going to see that they invested in plenty of great driving upgrades, including new CPP tubular A-arms and front disc brakes. Beautiful, rare, powerful, and an all-around driver this is the best of everything. And if you hurry, it can all be yours. Call now!